The report highlights the failure of certain electronics and electric car companies to ensure that the cobalt used in their batteries is not sourced using child labor. It names several automakers like Mercedes, VW and BYD, as well as several battery manufacturers known to supply automakers, like LG Chem (GM and Nissan). The report also goes after electronic giants Apple, Samsung and others. More than half of the world’s total supply of cobalt comes from the Democratic Republic of the Congo (DRC), where according to the government’s own estimates, 20% of the resource is extracted by what they call “artisanal miners” (approximately 110,000 to 150,000 workers). Amnesty says that these “artisanal miner” mine by hand using the most basic tools to dig out rocks from tunnels deep underground and can include children as young as seven years old. The organisation visited five mine sites in southern DRC in April and May 2015, where they interviewed nearly 90 people who work, or who have worked, in the mines, including 17 children. In its report, Amnesty International describes human rights abuses in these “artisanal mines” due to very poor work conditions and chronic exposure to dust containing cobalt, which can result in a potentially fatal lung disease. Most children interviewed by Amnesty indicated that they earned between 1,000-2,000 Congolese Francs per day (US$1-2). The report makes several recommendations to the DRC in order to stop the practice, but also to the governments of countries where are headquartered the companies ultimately using the resource for their products. 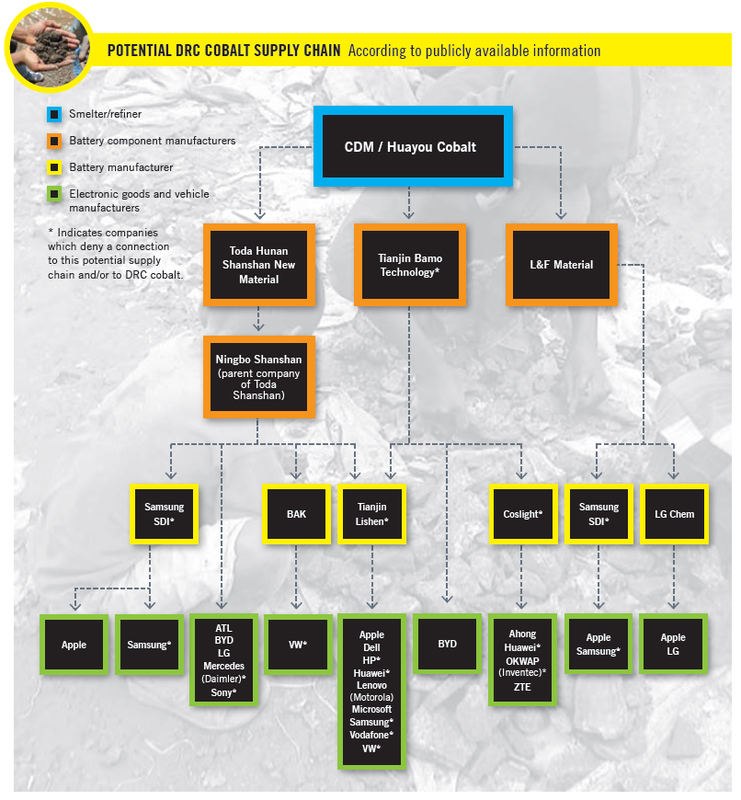 In its report, Amnesty is critical of several companies for not making enough due diligence to ensure that cobalt sourced by child labor doesn’t end up in their products. The organisation traced the supply chain back to LG Chem, which supplies automakers such as GM and Nissan. China’s biggest electric car maker, Warren Buffet-backed BYD, is named on several occasion in the report. Even tough Tesla Motors’ battery cells are made using cobalt for the cathode, the company is not named in the report because its main battery cell supplier, Panasonic, sources its cobalt from the Philippines and not Congo. Although, Tesla recently signed a battery supply agreement with LG Chem, which is named in the report.